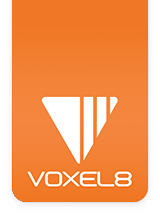 Read the entire set of visual start guide steps before powering on your Voxel8 printer. 1. Locate the provided black three prong AC power plug (see Picture 001) from your shipping box. Picture 001: AC Power Cable. NOTE: This shielded cable is rated at 13 Amps and 125V. You should use only this cable with your Voxel8 Developer's Kit Printer. The power supply inside the unit is auto-switching from 120V - 220V. 2. Find the 3 prong AC outlet on the back rear of the printer (see Picture 002) and plug in the supplied AC power cable from the previous step (see Picture 003). TIP: It's best to plug the printer in before arranging the printer in its final place, since it might be challenging to reach when close to a wall or other object. Picture 002: Power outlet on left rear. Picture 003: Power cable securely plugged in. 3. Next, find a power wall socket nearby that you can the opposite power cable end into (see Picture 004). Picture 004: AC Power outlet. NOTE: Refrain from plugging your Voxel8 printer into a power strip that is not rated for power tool usage as the Developer's Kit does take a few amps to operate.